danipeuss.de is a German online shop where you'll find a wide variety of the latest papercrafting products. Dani's creative team also provides you with fabulous craft inspiration, tutorials and videos working with the monthly kits and exclusive Klartext stamps for card-making, scrapbooking and everything in between. danipeuss.de is a German online shop where you'll find a wide variety of the latest stamps, scrapbooking, mixed media, planer and Project Life products. Dani's creative team also provides you with fabulous craft inspiration, tutorials and videos working with the monthly kits and exclusive Klartext stamps. 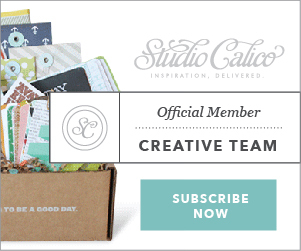 Studio Calico is an online community and curator of designer kits and coordinating add-ons containing the latest papercrafting supplies. They offer different types of crafting kits every month. One is designed for scrapbooking, one for life documenters, one for planners, and the newest addition is a stamp kit. Visit my Studio Calico gallery to see all of my CT work in one place. Neat and Tangled is a small company based on the East Coast in Northern Delaware with a focus on quality photopolymer clear stamps and craft dies. Their products have a cute, hand drawn, heartwarming feel and the various sets can be used together to create endless possibilities! Scrapbook Expo has been in business for over 18 years offering industry-leading consumer scrapbook shows in the USA. On their blog, they provide inspiration by top-notch crafters and regularly feature scrapbook and card designers in the industry. About the e-Book: The Jubilee e-book features 100 projects and designs from some of Studio Calico's favorite Creative Team members and friends. Scrap-Art-Zine (SAZ) was the first ever German magazine for scrapbooking, stamping, mixed media and all about getting creative with paper. I was part of their design team, i.e., one of the regular content editors for the print magazine (publisher: Andrea Gomoll) and blog in 2012.